This Saturday I'm going to be at the Fuse Medway Festival in Kent, where - amongst a whole bunch other fun stuff that'll be going on, my esteemed colleague Gary Northfield has assembled a bunch of awesome comics creators to hang out in a tent and make comics and teach kids to make comics and... you know, all that fun stuff! Some of the people who will be there! And also some other people. 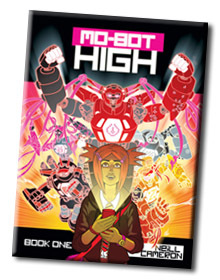 Just check out the amaaaaazing pic at the top of the post, drawn by the brilliant David O'Connell (Monster & Chips, Tozo, Ink + Paper). David will be there! 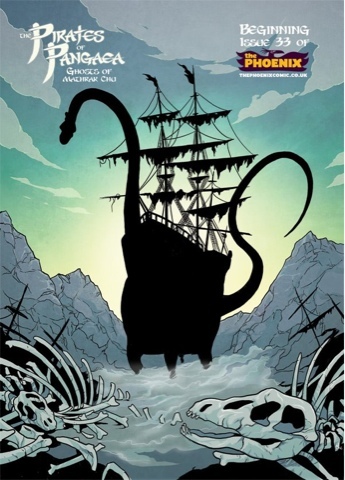 And so will all the people he has drawn: Jamie Littler (Cogg & Sprokit), Laura Ellen Anderson (Evil Emperor Penguin), Alex Milway (Mousehunter, the Mythical 9th Division series), and... ME (stuff that I do)! 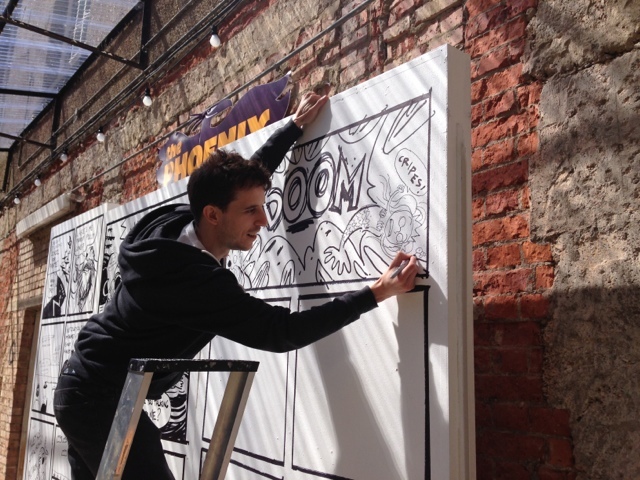 Jamie Littler drawing big comics! 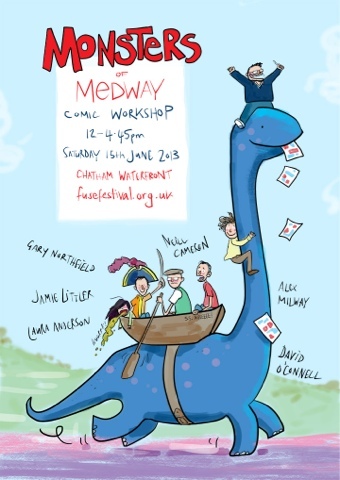 Do come along if you're in the area - if it's remotely as much fun as we had when we tried something similar at the Pop-Up Festival in King's Cross last year, or indeed at the Oxford Children's Comic Festival in May, then it will be a LOT OF FUN. 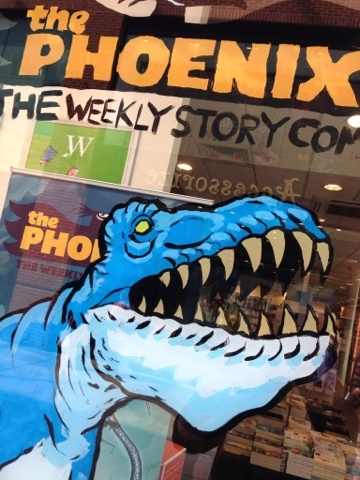 Anyway, because a few people have asked, I thought it might be useful to put together a handy checklist of the Stories So Far, and which issues of the Phoenix they appeared in! 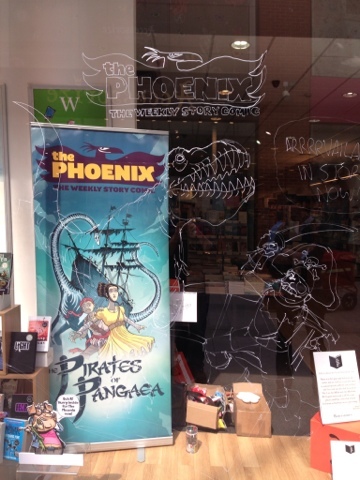 I spent this last Friday at Waterstones in High Wycombe painting big dinosaurs in shop windows; to help celebrate the launch of the Phoenix in that branch and also, just because it was an excuse to paint big dinosaurs in shop windows is and that is kind of my thing now? 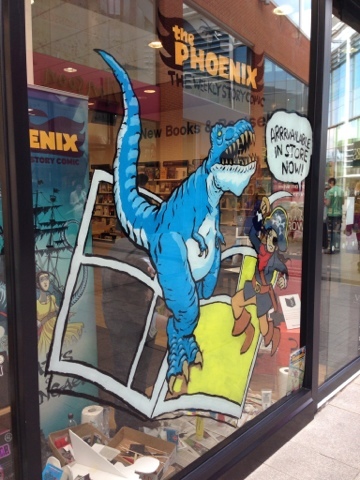 Anyway, in case you ever fancy having a go at painting big dinosaurs in shop windows, here is a STEP-BY-STEP guide to get you started! STAGE ONE: linework! 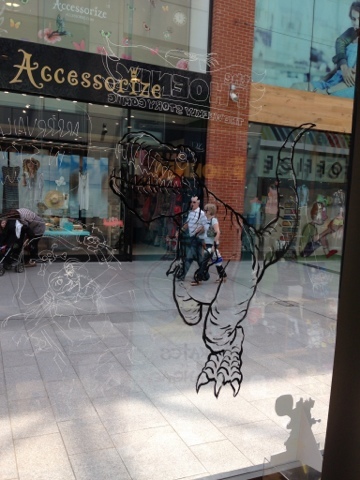 Drawn on the window's exterior using Posca pens. I really like this stage, you can just kind of see the vague ghost of what the picture might become. 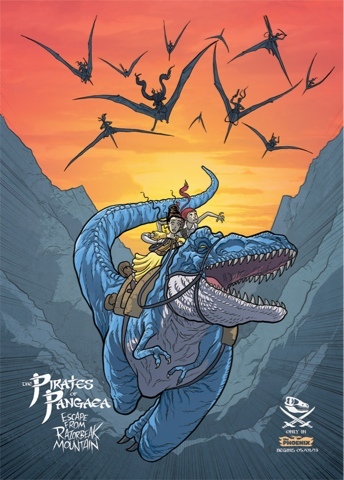 Which is, in this case, a dinosaur fighting a pirate. Because OF COURSE IT IS. 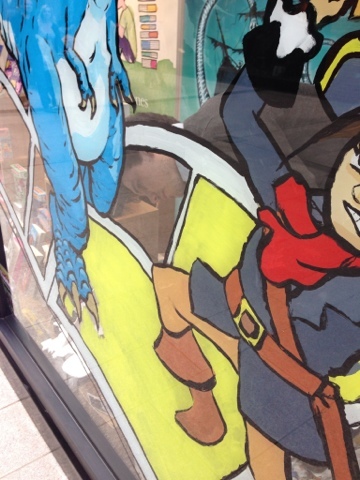 STAGE TWO: Painting the linework on the inside of the window. You can possibly see the pirate's face has gone a bit messy, which is because I decided halfway through to perform an abrupt piratical genderswap and turn him into a her. I dunno, it felt like the whole thing was leaning a bit boy-y? 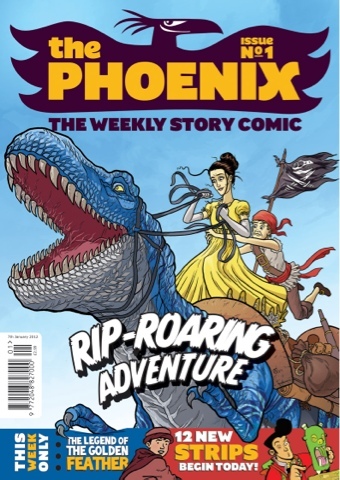 Of course, Cornflower (the T-Rex) is in fact a girl T-Rex. But I guess there is a slight chance the casual shopping passersby of High Wycombe may not be aware of that. STAGE THREE: linework completed, wait for it to dry, possibly wander off and find a sandwich, and then start to apply colours! You can get a better look at our now-female pirate here. 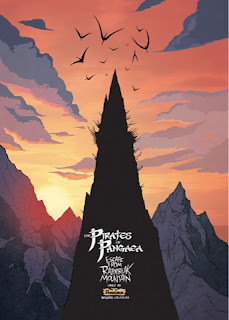 By losing the beard you lose a little bit of piratical iconicity but, y'know, at some point we as a culture need to start working harder to create new and more inclusive icons. And also she still has the hat and an eyepatch so WHATEVER. STAGE FOUR: starting to fill in the large areas of flat colour. 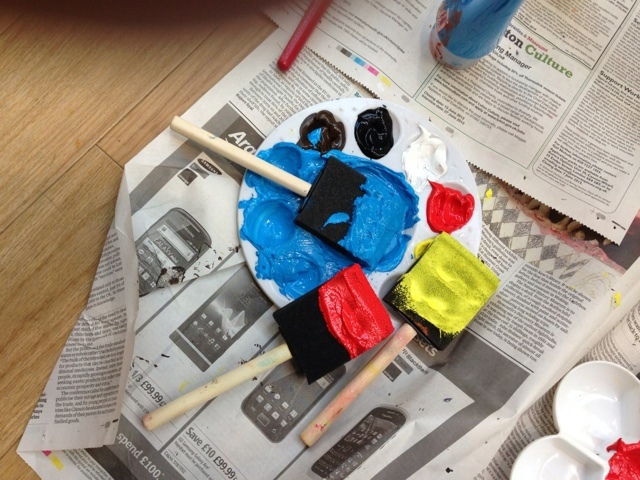 If you have someone on hand to assist with this: DO SO, as it is quite boring. In these pictures you can see Ross Fraser of the Phoenix, ably fulfilling this role. Make sure to stand behind them and regularly tell them that they've 'missed a spot', preferably just after they think they've finished and have cleaned their brushes. 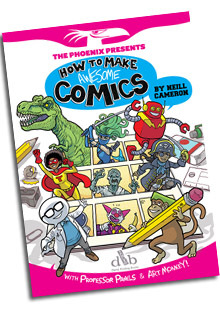 They are guaranteed to find this both helpful and hilarious! Now go and sit down, have a cup of tea, and wait for comics to reemerge as a populist and commercially successful artform. This may take up to an hour. 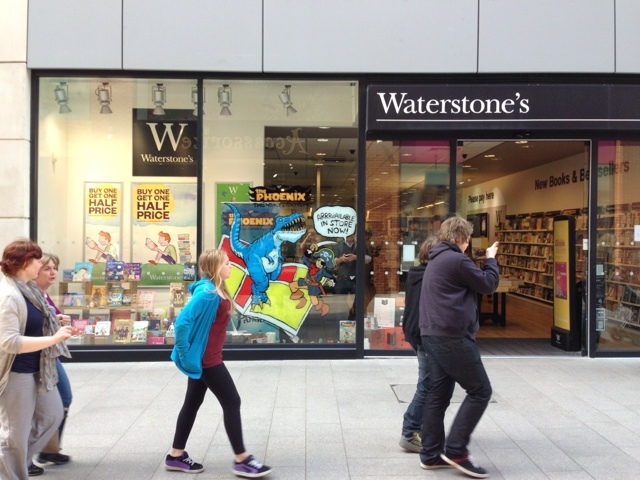 Anyway, huge thanks to Faye and all the team at High Wycombe for being so awesome and welcoming and comics-positive! 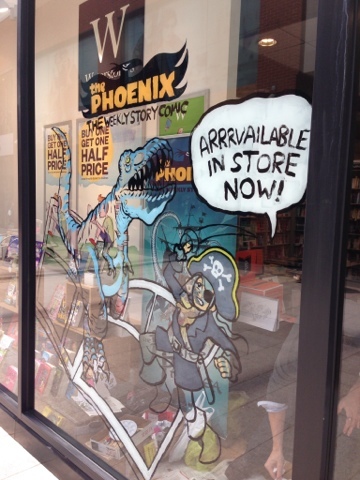 And for letting us paint big dinosaurs in their shop windows. 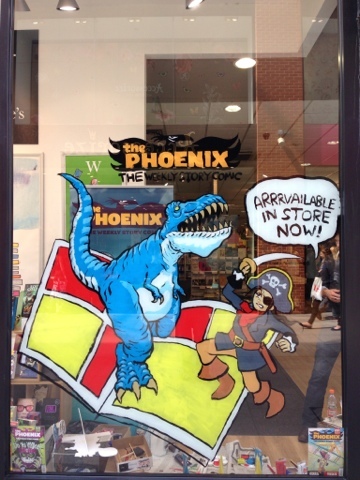 If YOU have any shop windows that you would like big dinosaurs painted in: please do not hesitate to get in touch. 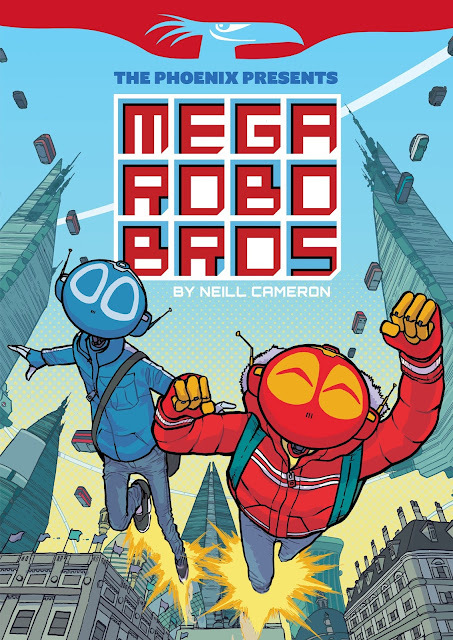 ALSO AVAILABLE: BIG ROBOTS.